Parents and students together in classroom. Engaging culturally diverse families as full partners in P-20 partnerships is important for researchers, educators, and policy investors as well as students and families. Families’ perspectives and advocacy are key assets for strengthening schools, programs, and partnerships. 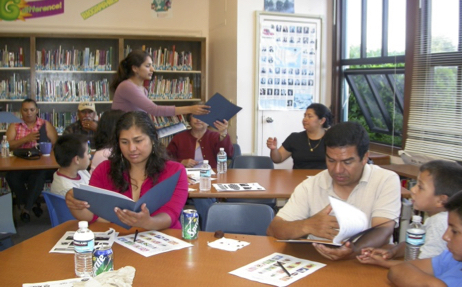 BMWA provides assistance to university-community partnerships to strengthen the engagement of diverse families. • The BMWA Cultural Bridges to College Report complied students' home languages in Arizona, California, Hawaii, Kentucky, New Mexico, and Rhode Island. Across these states, more than 150 home languages were reported on the U.S. Department of Education Home Language Survey. • In the Cultural Bridges to College Project, we provide links to materials in 11 home languages on pathways through school to college from Arizona, California, and Hawaii, and we will be adding material from additional states. In addition to English, the languages currently include Cambodian (Khmer), Chinese (Mandarin), Chuukese (Trukese), Hmong, Ilocano, Korean, Luiseno, Marshallese, Spanish, and Vietnamese. BMWA helped produce the materials in Khmer with support from the W. K. Kellogg Foundation.